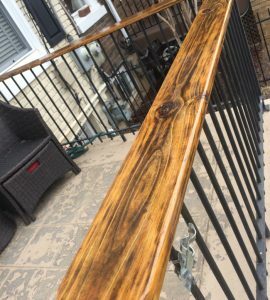 We have received another wonderful case study from our good friends over at Style With A Brush, a professional painting and finishing company specializing in chemical-free, eco-friendly products, on how they restored a railing that had been pressure treated, by using Owatrol’s Deks Olje D1 and D2 system. This house is situated in Washington DC and so gets a lot of bright sun exposure to it causing the wood to become bleached and dull. Luckily, the guys over at SWAB knew exactly what to do to restore it. Before applying any Owatrol products, you must always strip off any old previous finishes. This is because Owatrol products need to penetrate deep into the surface to allow for the best lasting protection and finish, which is not possible if there is another coating already on the surface. 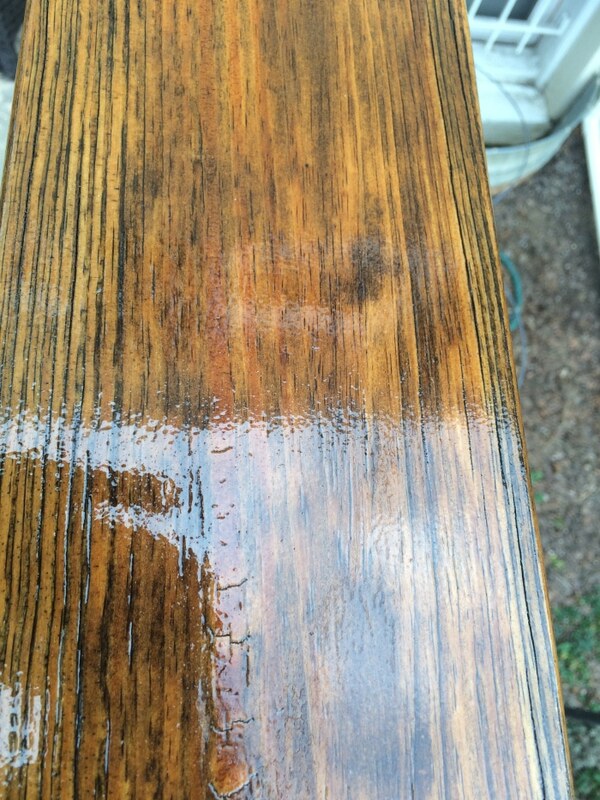 To strip the wood’s previous coating they used Marine Strip, our paint and anti-fouling stripper. It can be used on many surfaces such as wood, metal, plastic and GRP and can even remove up to 8 coats of previous coating in just one application! To use Marine Strip, simply apply with a brush, leave it to work (it will remain active for up to 12 hours – we’d recommend performing a touch test first to see how long it is going to take for the stripper to remove your coatings as it will depend on the coating to be removed). Then, simply wash it off whilst scrubbing with plenty of clean water (warm water will make this job easier but isn’t essential). After stripping you’ll need to neutralize the wood straight away using Net-Trol. After they stripped off the previous coating, they then neutralized the wood before applying their finish. To do this, they simply applied Net-Trol using a brush, waited for 10-20 minutes before rinsing and then scrubbed the wood with a brush to restore the wood’s natural color and neutralising the surface. Then, just allow your wood to dry thoroughly before applying your chosen finish. Deks Olje D1 will protect the wood from damage caused by moisture and UV exposure – it protects the wood from within and enhances its natural beauty. To get the best results, you must apply Deks Olje D1 ‘wet-on’wet’, meaning you mustn’t allow the wood to dry in between coats but instead apply the next as soon as the first has been absorbed into the wood. Continue this application until the wood is fully saturated (i.e. won’t absorb any more oil) and then wipe away any excess. If you’re completing a larger project you’ll need to work in sections that can be completed in 15-30 minutes to prevent the wood from drying out in between coats. Deks Olje D2 can only be applied once Owatrol D1 has already been applied and completely dried. Deks Olje D2 is a high gloss oil varnish which flexes and moves with the wood so will not peel, flake or blister. They applied 6 coats, allowing a minimum of 12 hours between coats (all coats should be applied within 1 month) to give the panels a nice depth and very high gloss finish. The best attribute of Deks Olje is that it won’t peel or crack. It just wares off over time thus leaving the future maintenance relatively easy and low cost! Time will tell but I’m anticipating three to five years before maintenance is required. 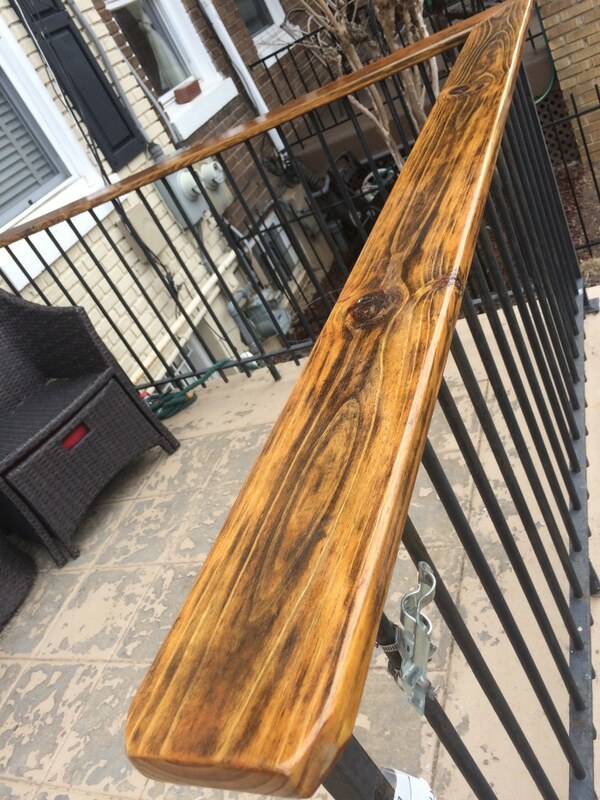 We think the railing came out looking fantastic! When you complete a job using such high quality products, the maintenance will be so much easier to handle – and won’t come around for several years too! If you have any questions regarding the use of Owatrol products on your next project, please feel free to contact us. I am looking to coat outdoor bar in Florida, so lots of sun, but only some direct sun on wall & corner of top. Will this hold up without mildew? Is there a satin finish for areas that I do not want high gloss? Also, can you apply this to decking? Thank you for your recent query regarding the use of Deks Olje D1 & D2. If the bar is for use in a commercial environment then I would not recommend D2 for use as it will not have the hardness required to withstand the wear and tear it will receive. If on the other hand the bar is for personal use e.g. external bar in a home, then yes it could be used but I would recommend a MINIMUM of 6 coats. It must also be understood that since it is a natural oil varnish, the finish is softer than a polyurethane or epoxy varnish and as such will require maintenance more often. How often is not possible to say as it very much depends on the wear and tear it will get. D2 will resist the growth of mildew. With regards to the deck, D2 being a natural oil varnish does not have the scuff resistance required to withstand regular foot traffic. In addition to this factor, it is also a gloss finish and as such will get slippy when wet. I strongly recommend against using D2 on a deck. I hope this was helpful, please feel free to contact us again should you require any further assistance.